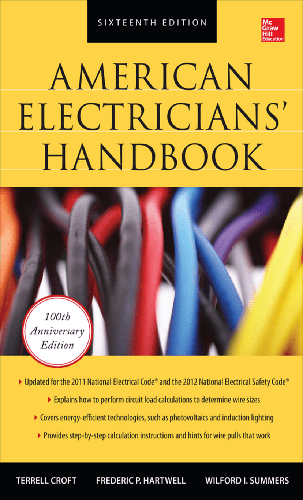 For a century, the American Electricians' Handbook has served as the definitive industry reference for information on designing, installing, operating, and maintaining electrical systems and equipment. The Sixteenth Edition is revised to comply with the 2011 National Electrical Code and the 2012 National Electrical Safety Code, and covers current energy-efficient technologies, such as photovoltaics and induction lighting. Detailed photos, diagrams, charts, tables, and calculations are included throughout. This practical, on-the-job resource is a must-have tool for every professional electrician.